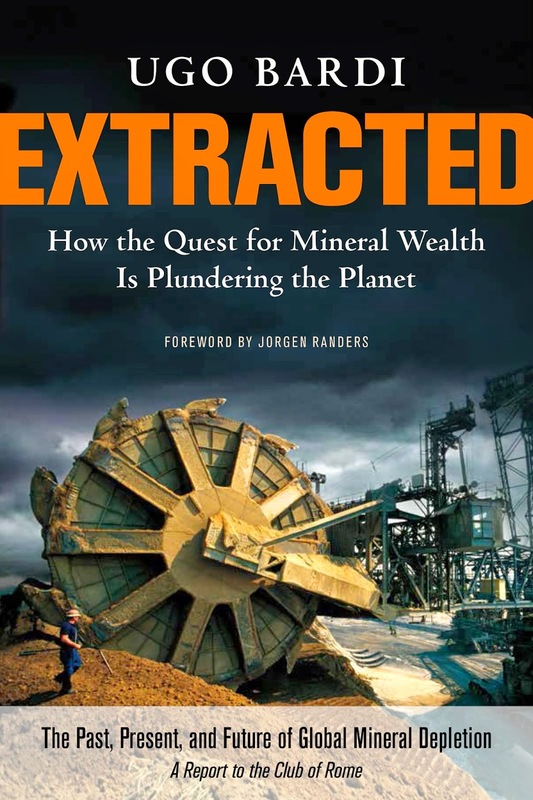 The main point that I am making with my latest book, "Extracted" is that mineral depletion is one of the major sources of our present economic and environmental troubles. Explaining this point is not easy: most people still seem to believe that depletion means "running out" of something. But that's not the case. Depletion is a gradual phenomenon that goes on all along the cycle of extraction of all mineral resources. Extraction starts with the "easy", high concentration resources, but gradually must move to more expensive, low concentration ones. As a result, the returns on extraction diminish with time (and extraction also causes more damage to the ecosystem). One of the consequences is the high prices we are seeing nowadays for all mineral commodities. It is not that we are running out of anything, but ore grades are falling everywhere, extraction is becoming more and more expensive, and that must have an effect on the market prices. The gradual disappearance of low cost/high grade ores can be seen with practically all mineral commodities, but it is especially evident with some of them. The article below is reproduced from Steven S. Rocco's blog and it describes the present situation with gold. 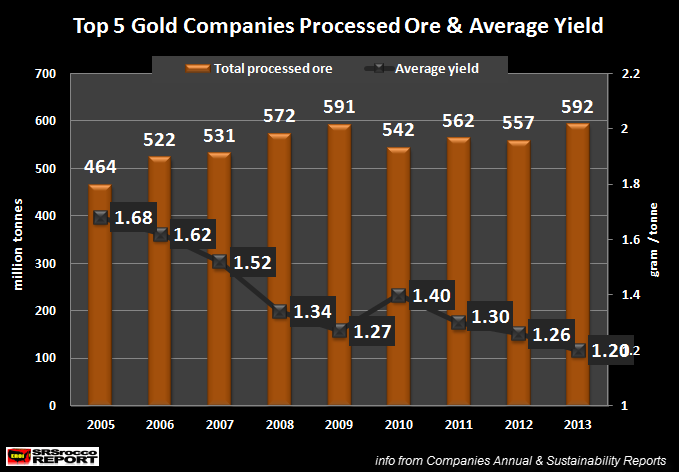 As you can see, the gold industry is processing more and more ore to produce less and less gold. It is the inexorable law of depletion at work: we are not running out of gold, and we probably never will. But we'll have to face a falling supply. With the results for 2013 finally in, the top gold miners average yield fell to the lowest level ever. This is a surprising development considering that the average price of gold dropped to a low of $1,411 in 2013. Normally when the price of gold falls, gold miners switch to higher grades to remain profitable. 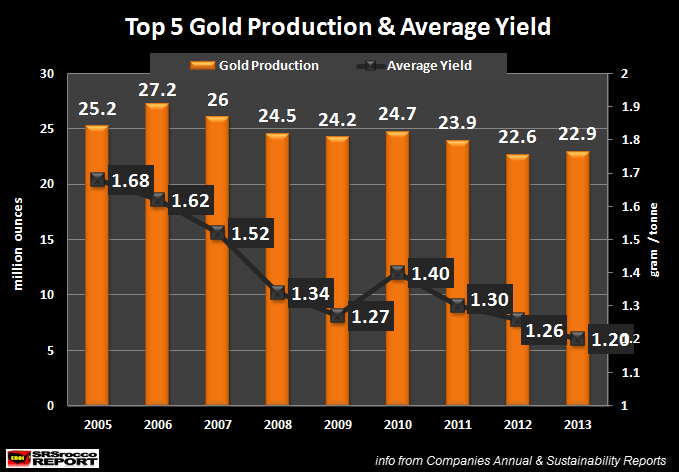 However, the top five gold miners’ average yield declined another 5% in 2013. If we look at the chart below, the top five gold miners (Barrick, Newmont, AngloGold, Goldfields* & Goldcorp) average yield fell from 1.26 grams per ton (g/t) in 2012 to 1.20 g/t in 2013. Furthermore, the average gold yield for the group declined from 1.68 g/t in 2005 to 1.20 g/t in 2013. Which means these miners lost 0.48 g/t in just eight years… a 29% decline. That might not sound like a lot, but if we do the math… it’s a substantial loss. The next chart provides the astonishing blow to the gold mining industry. In 2005, the group processed 464 million metric tons of ore to produce 25.2 million ounces of gold at an average yield of 1.68 g/t. In 2013, this same group processed 592 metric tons of ore (27% more), to produce 22.9 million ounces of gold. Newmont doubled the amount of waste rock generated to produce an ounce of gold in 2013 than it did in 2005. This wasn’t a straight increase over the eight year time-span. However the waste rock/ production ratio was 86 metric tons per ounce of gold in 2012… 65% higher than 2005. The more waste rock Newmont has to remove, the more energy is consumed in the process. In 2005, Newmont consumed 19 gallons of diesel in its operations to produce one ounce of gold. By 2012, this increased to a staggering 31 gallons per ounce…. a 63% increase in seven years. As we can see, falling ore grades become a very expensive factor for the mining industry. Not all the top five gold miners suffered a decline in average yields in 2013. Barrick, Newmont and AngloGold saw a drop in average yields in 2013, while GoldFields (include Sibanye Gold) and GoldCorp reported a slight increase. AngloGold’s average yield fell 15% in 2013 compared to 2012, while Newmont declined 10% and Barrick at 6%. Even though these declines seem quite large, I imagine we may actually see a leveling off or increase in yields from these companies in 2014. Unfortunately, high-grading their mines to remain profitable at lower prices is only a temporary solution. Worse yet, the link provides information on how this method can leave a great deal of gold in the ground due to selecting the high-grade ore while leaving low-grade ore uneconomical to extract. So, if these top gold miners decide to high-grade their mines, we may see a leveling (or slightly rising) of yields in 2014. However, this may actually speed up the decline rates in yields further down the road. I am waiting for data to be released by two companies so I can update my chart on the average diesel consumption per ounce from the top five gold miners. With the majority of results already in… I can honestly say, diesel consumption per ounce in 2013 will hit a new record high. As ore grades continue to decline, the cost to produce gold will inevitably rise. Some readers believe the higher energy price will be the factor to push the value of gold to new highs. Actually, I don’t believe this will be the case. The world cannot afford high oil prices. We may experience temporary OIL PRICE SPIKES, but I doubt the price of a barrel of Brent crude will continue to rise towards $200. The price of gold and silver will rise to extreme levels in the future not on the back of higher oil prices, but rather due to a falling oil supply and its impact on the $100+ trillion of worthless paper-mache floating around the world’s markets. It's very interesting to see how rapidly ore grades are declining. Since the companies studied are continuing to process more and more ore as grades decline, I speculate that they must still be making money (without looking at their financials). I wonder what the average break-even grade is at the current gold price? It is a good question that goes at the core of the depletion problem. Companies extract as long as they make money extracting; at some point, however, they reach a break-even grade and from then on production tends to decline. About gold, it is possibly the mineral most affected by speculation, but Rocco makes the point here that you can't ignore the cost of extraction. Homestake Mine in South Dakota was the number one gold producer in the United States for more than a half a century. As we can see, the Homestake Mine produced 578,715 oz of gold in 1970 at an average yield of 9.2 g/t. Furthermore, gold production from the entire state of Nevada (based on primary gold mines alone) was 407,705 oz at an average yield of 7.7 g/t. In just 40+ years, look how much the gold yields have declined. Basically, the gold companies are now mining what comes down to be... GOLD DUST. I have noticed that many of the top gold companies are spending more in CAPEX then they receive in FREE CASH FLOW... which means they are producing gold at a loss, even though they may state a positive net income for the quarter or year. It will be interesting to see how things unfold in the gold mining industry as the peak and decline of global oil production starts to reveal its ugly head. The article at the link below came out yesterday in Gold Investing News: "Mining is a Difficult Business: Adrian Day Weighs Investing in Major and Junior Gold Companies". (Adrian Day is a reasonably well known global investment analyst who also specializes in mining) The article is written from an investment perspective and does not focus particularly on the continually decreasing gold grades but it does talk about the diminishing resources / reserves base of the majors, the difficulty in finding more gold and the acquisition strategies they employ to try to deal with this problem. (and why in his view their timing is poor) He also says that -in particular regarding juniors- "“If you look at the mining companies today relative to the price of gold, you can see that they are selling at multi-decade lows relative to bullion, which is a great opportunity." In broad terms I would agree with your closing statement that "The price of gold and silver will rise to extreme levels in the future not on the back of higher oil prices, but rather due to a falling oil supply and its impact on the $100+ trillion of worthless paper-mache floating around the world’s markets"
In either case it does not seem like it would be a particularly peaceful or tranquil time to live through. But then again, neither does right now.